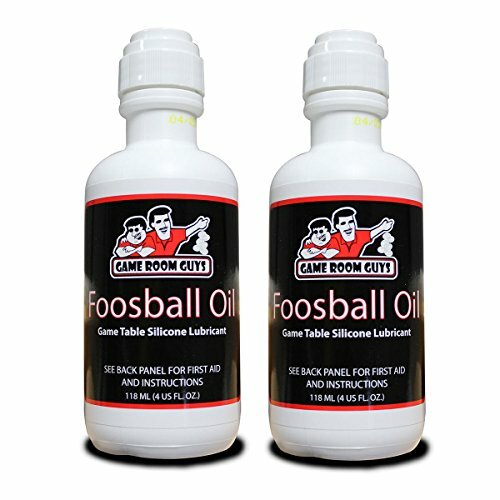 Pkg of 2 - 4 oz Bottles of Game Room Guys Foosball Oil No mess! Built-in applicator tip Twice as much, for the same price! Works on all major brands of foosball tables Cleans and lubricates bearings 100% Silicone. Will not damage your bearings and bumpers like oil based lubricants. Helps extend the life of your table No odor. Environmentally safe. Made in the U.S.A. If you have any questions about this product by Game Room Guys, contact us by completing and submitting the form below. If you are looking for a specif part number, please include it with your message.